This item is licensed with the Creative Commons Attribution License. This license lets others distribute, remix, tweak, and build upon this work, even commercially, as long as they credit the author for the original creation. 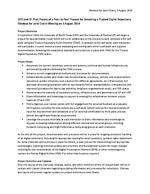 Handout for Joint Chairs, 6 August 2014 UNT and UF Pilot Project of a Peer to Peer Process for B ecoming a Trusted Digital Repository Handout for Joint C h airs Meeting on 6 August 2014 Project Overview In September 2014, the University of North Texas (UNT) and the University of Florida ( UF ) will begin a project for approximately 1 year which will be to collaborate on the process to each complete a full selfaudit using the Trusted Repository Audit Checklist (TRAC). In addition to the self audit, each institution will participate in a peer rev iew process evaluating and scoring each others self audit and supplied documentation following the established standards and practices in place with TRAC for the Trusted Digital Repository (TDR) status P roject Goals Document the current repo sitory services and systems, technical and human infrastructures, and overall operations following the TRAC process Enhance current organizational methods and processes for documentation; Collaboratively update and create new documentation, processes, po licies, and related actions (document update schedules, best practices for different agreements, etc.) if/as needed, but approach all existing operations with an eye towards further standardization, transparency, and improved operations for day to day acti vities, long term organizational needs, and TDR status D emonstrate the maturity of repository services, infrastructure and governance at UF and UNT Share information and knowledge to support increasing the collaboration betwe en project teams at UF and UNT Pilot a rigorous peer review option with full engagement for external feedback as a valuable third option; currently the only options are a self audit (which reduces the level and variety of input for improvement and validation) or a full external certification by third party process (which has significant financial requirements) Leverage the process internally at each institution to share information and knowledge to support increasing collaboration among different internal and external groups, includ ing Research Computing and High Performance Computing groups at each institution At the end of this project, documentation and processes will be in place for ongoing consistent handling of all digital coll ections, including for appropriate routing for email questions, updated rights statements for some materials with a process in place for others, a clear process for determining new appropriate technologies, planning technical updates and priorities, and foundational support for major changes including for the consideration of the Digital Preservation Network (DPN) or other technologies to replace the Florida Digital Archive (FDA) if or when that becomes required. Project Activities and Updates Over the course of the next year, Chelsea, Laurie, and other members of the UF project team will be in contact with Liaison Librarians regarding updatin g information and processes for collections Chelsea and Laurie will provide r egular updates on project activities to Joint Chairs.